Following part 1, where I covered the general and methodology aspects, part 2 will look into some specific aspects on SAP HCM for implementation teams to keep in mind, when migrating to SAP SuccessFactors or a different Cloud HR solution. Let me point out some areas in particular, where awareness of the starting point is crucial. Most of the examples are leaning towards a SuccessFactors migration, which is still easier when coming from SAP HCM than other tier1 cloud solutions. In SAP HCM, you have several ways to define structures. The most rigid one is the assignment of employees to Personnel Areas, Personnel Subareas and Payroll areas and the dependencies with the financial and legal structure. 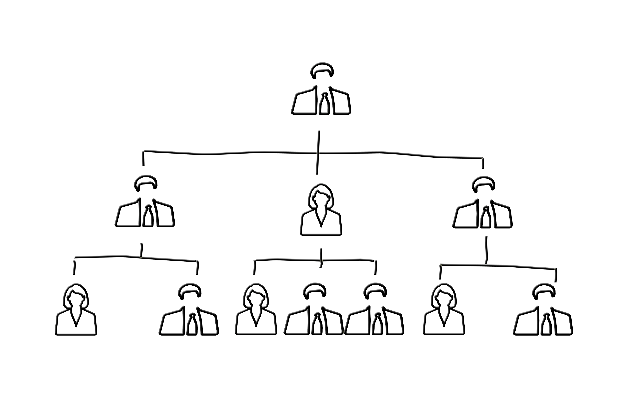 It may resemble the disciplinary structure or the Org chart in some cases, but can also be quite different. It’s primarily designed to define calculations in payroll and Time&Attendance, and to control master data. As the actual structures organisations work along are moving further away from legal and physical structures including boundaries between countries, this rigid structural data less and less recognisable in the Org Chart. Coming up with a design in the cloud solution that serves the same purpose without trying to re-build it 1:1 and thus curtailing the new solution, is always one of the major challenges. This becomes particularly challenging, when you can’t just forget the old world, but have to feed back into it through an integration to support your payroll. Having a start date and end date for almost every piece of data plus managing rigidly, whether certain sets of data can have gaps between records or records existing in parallel is almost a religion in SAP HCM. None of the major cloud solutions takes this quite as seriously, though SuccessFactors is more mature in that respect than Workday. Again, this becomes most critical in an integration scenario that moves data from the cloud solution back into SAP Payroll. Traditionally, cloud projects left very little time and budget for data migration. Just providing spreadsheet templates and asking the customer to populate them ready for import without much explanation was not unusual. But it’s never a simple 1:1 mapping exercise and it’s not easy for the customer to know, what each field means. The last two points about org structure and effective dating make this clear already. The manual process also makes it very difficult to manage migration quality and improve it consistently from test load to test load. It was never easy even from SAP HCM to SuccessFactors, though the Infoporter as a standard tool provided by SAP helps a lot. Moving into Workday is even more difficult due to the very different design, and the standard tools are not very convincing (in fact, the Adessa Data Migration and Integration team had to develop their own tools to make it manageable). The main problem here is that data migration is underestimated far too often – again, our experience shows that’s the case even more often in Workday migrations, where our team has been called in for rescue missions quite a few times. It’s certainly easier for typical 1st generation cloud customers coming from very restricted legacy solutions and that’s what traditional cloud migration methodologies have been developed for. For SAP HCM customers, who are used to a fully integrated solution between Core HR, Payroll, Time & Attendance and Finance, this will always be very important. The complexities of migration also hit home in integration, but with much stronger impact, because it’s an ongoing process rather than an ad hoc activity. Often, a lot of data needs to flow from the cloud into SAP HCM, as it’s needed for payroll, T&A, finance or other processes. The cloud solution needs to be designed in a way that the information needed to update SAP HCM is still available. On the other hand, there is always a risk that this requirement leads to an implementation that doesn’t use the strengths of the cloud solution and has a negative impact on user experience. Again, SuccessFactors offer better tools than the competition including the Business Integration Builder (BIB). The lack of integration awareness amongst traditional cloud consultants as well as sales reps is stunning. “Let’s do the basics first to optimise Time to Value and add integrations later”, is something I have heard more than once. It really beggars belief! Nothing illustrates more that a consultant or sales rep don’t understand the customer’s situation: For organisations, who already have fully automated integrations between coreHR, Payroll, T&A, Finance and other solutions, it is just completely unacceptable and usually unfeasible to go back to manual “interfaces” for a year or more to allow for a step by step cloud implementation. Payroll is the single biggest reason for SAP HCM customers being dissatisfied after a cloud migration. To begin with, SAP has arguably the strongest and most flexible global payroll. 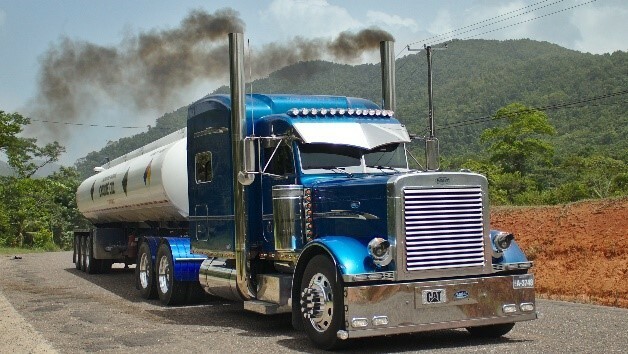 So, customers moving to a cloud solution other than SAP’s Employee Central Payroll, which is using the same engine, will often be dissatisfied. That makes it even more surprising that many consultants seem to believe that an arrow on a PowerPoint diagram pointing to a box saying “Third Party” or “Outsourced” is all that’s needed. 1) There may or may not be good reasons for payroll outsourcing, but lack of knowledge of your cloud consultants shouldn’t be one of them. In fact, we see the availability of SAP SuccessFactors Employee Central Payroll (ECP) with its Payroll Control Centre (PCC) as a very good reason to consider insourcing a hitherto outsourced payroll for the many customers, who don’t get the expected efficiency gains and quality from their outsourced payroll. 2) The problem won’t even go away with outsourcing. You still need to implement a robust integration with the vendor and despite of “packaged integrations” some of these vendors offer, the integration is usually less mature than, say, the one between SAP SuccessFactors and SAP on-Premise Payroll or Employee Central Payroll. Some people love Authorisations in SAP HCM, some hate it. Whatever your position: expect it to be very different in SAP SuccessFactors or other cloud solutions. I’ll use this point as an example, where a big change hits in an unexpected area. 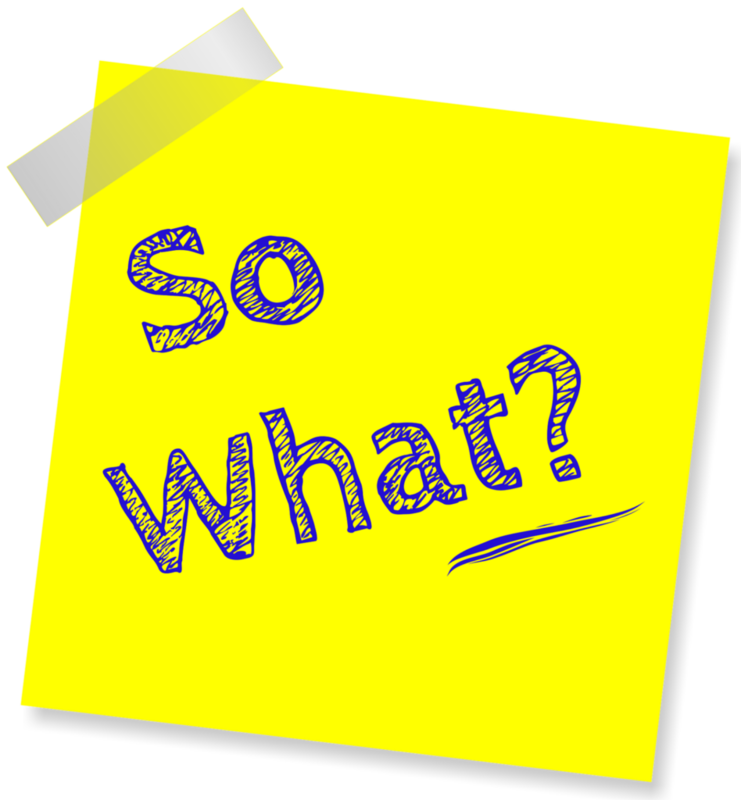 If you are usually not involved in authorisations management, you may want to skip this part. 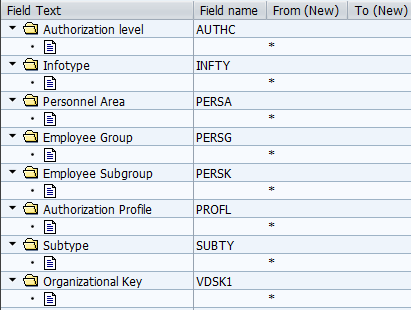 SAP HCM authorisations are very generic and try to hang almost everything onto the data, not so much onto the activity (yes, you can grant access to certain transactions, but that’s a very broad view and it doesn’t come with any context). When designing SAP HCM authorisation profiles, you’ll spend 90% of your time with generic authorisation objects like the one below (it’s called P_ORGINCON), where you define the accessible data by infotypes (= screens) and a number or organisational groupings. Of course, this is simplifying it a lot, but what I want to show you is that it’s very generic. This allows you to cover a lot with the same little tool, but it also can make some things very complex or even impossible to cover. 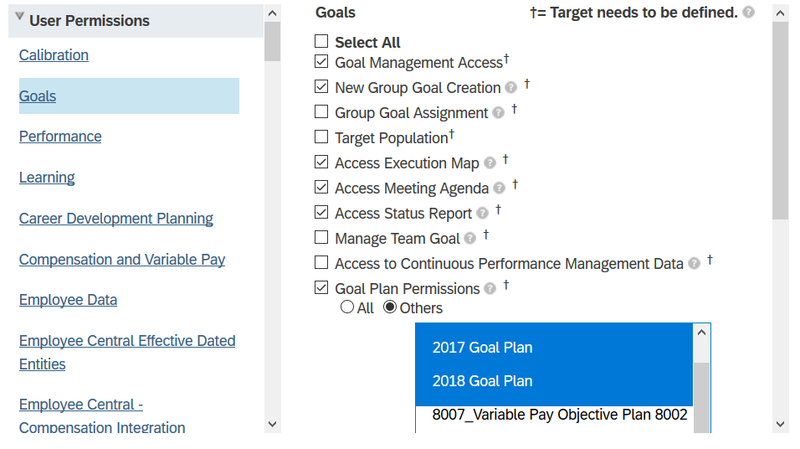 You’ll find that the majority of SAP HCM customers are not even using this object, but an older version (P_ORGIN), which can’t even connect the data access to a section from the Org Chart, so you are left with a very limited number of options to define the employees the access should apply to. If a customer has worked hard for 20 years to make their user rights fit into this schema, it won’t be easy to just move it over, because the approach is very different. Because the solution is so limited, it comes with many ways to extend it. There are many points, where customers can add their own coding to make the system fit all of their sensible as well as the not so sensible requirements. I’ve seen a lot of bad things in this custom coding – including hard coded personnel numbers. The concept of “who”, “what”, “for whom” is built in naturally using groups, which can be defined in many ways (statically or dynamically) to answer both the “who” and the “for whom” questions. SAP HCM Time Management has a very powerful engine using the same principles as they use for payroll. Currently, no full suite Cloud HCM solution gets even close to the flexibility in calculating results based on clock times and other inputs. It may not be the most use friendly solution and it may lack certain features like operational workforce planning / scheduling, but, hell, it’s flexible in its calculations. And, because it comes with an integrated payroll, it is also pretty strong in statutory localisation for absence management, most notably for sickness, maternity and parental leave. Just to give you a little taste: the picture on the left shows a tiny part of the SAP Time Management Schema, the heart of its configuration. You’ll typically have >1000 of lines with this cryptic code that still goes as “configuration” in SAP. If that’s not enough, there are still options to add custom code. So, you need to be very careful, when promising your cloud solution can cover Time & Attendance. In most cases, a specialised solution like Atoss, Kronos or Workforce Software will be required to cover more complex T&A needs, although SuccessFactors Employee Central is catching up with their own T&A capabilities. If you do go with a 3rd party solution for time, you’ll immediately hit another expectation difficult to match: in SAP HCM, Time Management is extremely tightly integrated with payroll, particularly when it comes to retro-active changes. SAP SuccessFactors beats SAP HCM in respect to built-in reporting tools hands down. No argument about that. That picture changes a bit, if you include BW as a separate tool, but that would be the equivalent of adding SuccessFactors Workforce Analytics and SAP Analytics Cloud to the SuccessFactors side, still making the cloud tool the clear winner. However, if SAP HCM customers talk about reporting, they don’t usually think within the narrow box of the built-in Query tool or the standard reports available. They think about customer reports, which can be programmed quite easily by developers with some experience. Larger customers have their own developers (it comes in handy that much of the skill set required overlaps with that needed for other SAP modules like Finance or logistics), whilst smaller ones ask their consulting partners. So, when you migrate from SAP HCM to your new cloud solution, there will usually be a whole zoo of custom reports and the customers instinct will be to say “we need all that in the cloud, too”. The truth is: most of them won’t be necessary anymore, but there’ll be always some and it may be a stretch to build them with SuccessFactors reporting tools (ORD, YouCalc or BIRT), let alone most other cloud HCM solutions. Customers need to buy into defining their reporting and analytics needs from scratch and in most cases, they’ll end up with a better solution in the long run. Just don’t raise false expectations by saying “Our reporting tools are very flexible. Don’t worry about that”. The same as we’ve said about custom reports applies for other enhancements. Customers may have had more than 20 years to have developers add all kinds of features. 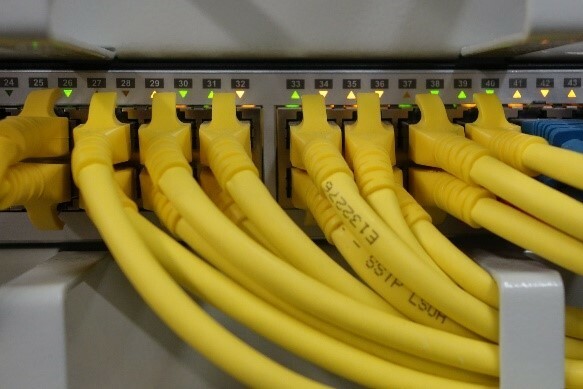 Most cloud solutions have only one answer to this: “You have to stick to our standard”. SAP SuccessFactors offers an astonishing level of flexibility in its configuration, in fact, the extension centre allows customers to configure new scenarios that would have required a lot of custom coding in SAP HCM. But at the end of the day, there are limits that come with the cloud concept. Don’t ignore these things. Address them without rushing to extensions (e.g. using the SAP Cloud Platform SCP) as a knee-jerk reaction every time. There are often good ways to achieve the same thing without extensions. But you can only have a sensible conversation, if you acknowledge that some of these custom developments may add value and find a solution together. Just saying they are “stupid” if most likely not the best way to get the customer on board for the change journey. SAP arguably has the most sophisticated solution to manage changes in configuration and coding across development, test and production systems, called the “transport system”. Customers moving away to any other solution, cloud or on-premise, are usually disappointed. Again, SAP SuccessFactors is one of the cloud solutions closest to that with their constantly improving instance synchronisation tool. However, it is important that customers understand what it does and what it can’t do. This will make them appreciate the importance of version management in configuration files and workbooks much more than telling them “we have a very similar tool” only to wake up to a big surprise later in the project. Just to be very clear: I am not advocating the use of consultants with no experience in the target cloud solutions. And I’m definitely not in favour of using old SAP HCM implementation methodologies for cloud solutions (I didn’t like them back in their heyday and preferred an iterative approach even then, though didn’t call it “iterations”). However, I am convinced that the starting point is a very important factor for the design and implementation of the cloud transformation and, if that starting point is a comprehensive solution like SAP HCM, then knowledge of that solution should be used, if at all possible. I also advocate that the experience from very simple cloud implementations is only partially transferable to a more complex target architecture, where core HR is at the centre of an important integration landscape. If you have key solutions (access management, workforce scheduling, compliance, plant data collection, …) currently depending on an integration to your SAP HCM solution and your cloud vendor or consultant says “Keep it simple! To optimise ‘time to value’ we go live without interfaces in phase 1 and then you can add to it as you go along.”, then you’d better run far and fast.